U.S. Secretary of Transportation John Volpe (l), Amtrak President Roger Lewis (c) and Amtrak Board of Incorporation Chairman David W. Kendall (r) unveil the first Amtrak route map. Despite a brief revival of rail services in the years following World War II, American railroads faced challenges by the mid-20th century. New interstate highways and the aviation network—largely planned and constructed with federal funds—lured passengers and intercity freight operators to the roads and skies, dealing a double blow to the railroads’ bottom line. Many companies petitioned the Interstate Commerce Commission to allow them to discontinue unprofitable passenger rail services. Between 1958 and 1970, the number of miles of rail line used for passenger service dropped from 107,000 to 49,000 , and hundreds of communities found their depots shuttered as there were no passenger trains left to serve them1. Recognizing the need to maintain passenger rail service, especially in dense, congested urban areas, Congress passed the Rail Passenger Service Act of 1970. Signed by President Richard Nixon on October 30th, it established a new for-profit National Railroad Passenger Corporation—later known as Amtrak—to take over the majority of the intercity passenger rail obligations belonging to the private railroads. In the first line of the Act, Congress declared, “modern, efficient, intercity railroad passenger service is a necessary part of a balanced transportation system…[and] that the public convenience and necessity require the continuance and improvement of such service…” The private railroad companies would give the new corporation rolling stock and one-time payments to help finance the venture and also allow it to operate trains over their rails. Amtrak service was to begin on May 1, 1971. Over the ensuing months, the Amtrak Incorporators and the U.S. Department of Transportation created a refined network map that included 28 routings serving 43 states and the District of Columbia. The U.S. DOT sketched out the basic map with defined route endpoints, but left the decision on exact routings to Amtrak, which considered factors such as population centers served, condition of the infrastructure and operating costs. 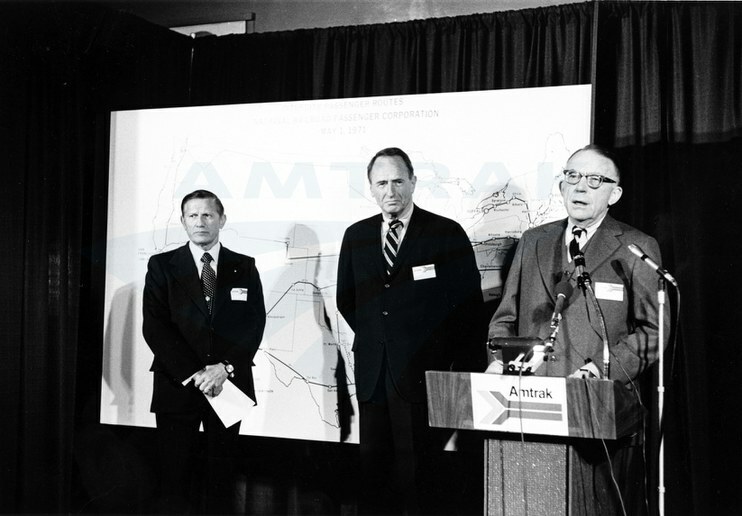 The new map was revealed to the public by U.S. Secretary of Transportation John Volpe, Amtrak President Roger Lewis and the Amtrak Board of Incorporation’s Chairman David W. Kendall in March 1971. While most private railroads handed over their passenger operations to Amtrak, some, such as Southern Railway, continued to run flagship services for a few more years. The challenge before the new company was monumental, as there had never been a truly national railroad that served all parts of the country. Stations and other facilities received new Amtrak branding. 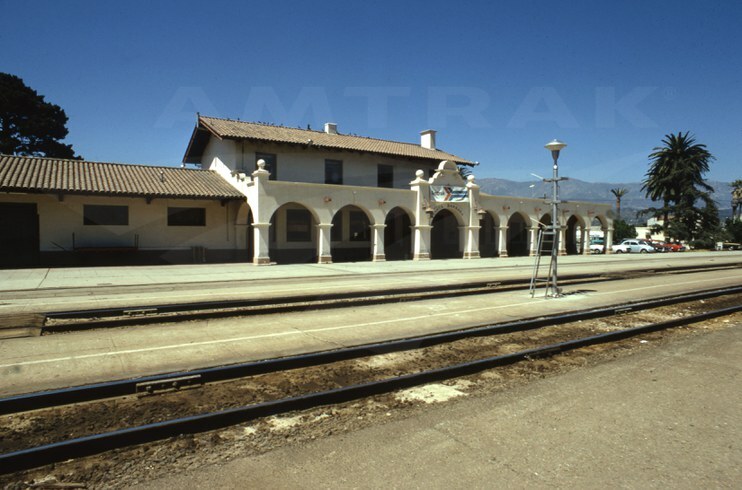 Amtrak had to create an organizational framework; hire and train employees; upgrade and standardize rolling stock and station facilities acquired from predecessor railroads; institute a comprehensive national reservations system; and craft an advertising campaign to inform the public about its services. The first Reservations Sales Office opened in Chicago on October 1, 1971—five months after Amtrak went into business. 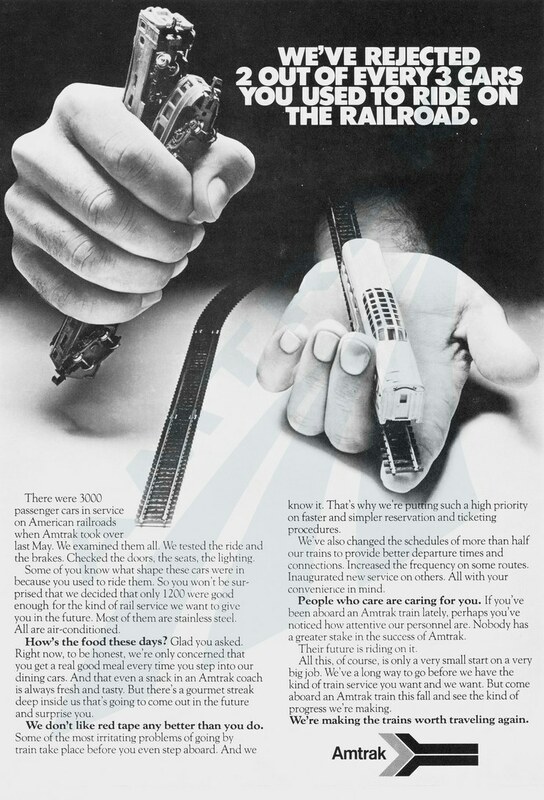 Many early promotional materials detailed the improvements that Amtrak was undertaking, from the cars to food to scheduling, and asked the public to give the service a try. Within a year, the company had expanded its reach to Canada. The Pacific International, featuring a Dome Coach, ran between Vancouver and Seattle, while the southbound Washingtonian and northbound Montrealer plied the Washington, DC—New York—Montreal route. Massachusetts, Illinois, and Pennsylvania took advantage of a provision in the Rail Passenger Service Act that allowed them to partner financially with Amtrak for additional services beyond those established under the basic route system: Boston—Worcester—Springfield, Chicago—Quincy, and Philadelphia—Harrisburg, respectively. 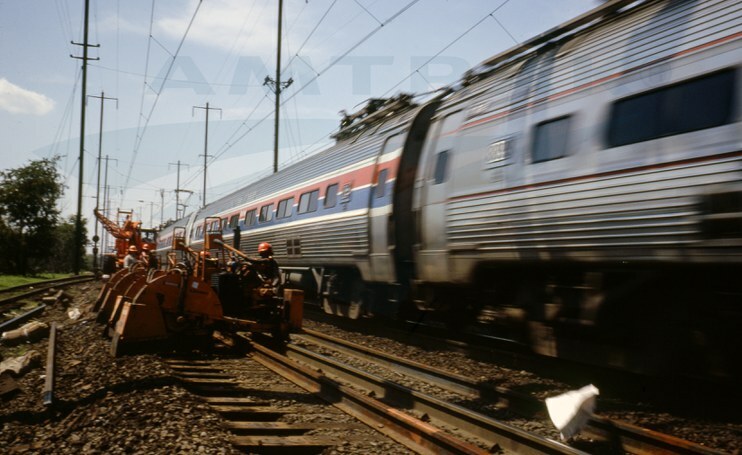 Along the busy Northeast Corridor, the frequency of the high-speed, electric Metroliner Service, originally developed in the late 1960s by the Pennsylvania Railroad and its successor Penn Central with federal backing, was doubled to keep up with demand. The hourly, limited stop service was popular among business persons since the three hour trip time between New York and Washington, DC was competitive with regional airlines. On long distance trains such as the Panama Limited (Chicago—New Orleans) and the Silver Meteor (New York—Miami), Amtrak introduced new china designs in an attempt to strengthen its brand. Although the first few years were a scramble to get a national network up and running, they set the foundation for future growth. 1 John F. Stover, American Railroads (Chicago: University of Chicago Press, 1997), 228.